About two months ago, I bought a beautiful aglaonema that I kept on my patio until the nights started getting really cool. I had never seen one with this coloring before, the leaves – most of their stems, too – are edged in red, while the insides are mostly shades of green and yellow. The plant is quite elegant, I think, and is just a treat to look at. 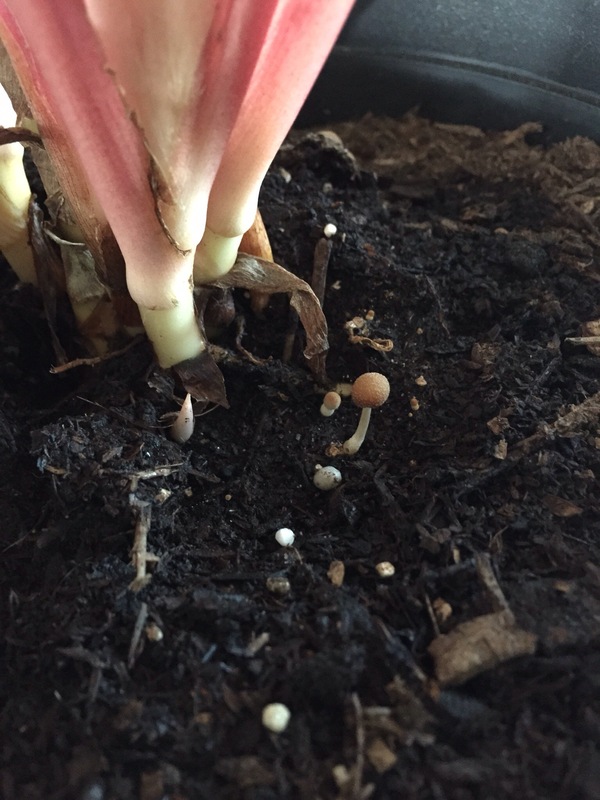 But for some reason, when I moved it indoors, leaves on the bottom started turning brown, and at one point, little mushrooms appeared to be growing near the base of the plant. I wondered on a Twitter #gardenchat one day if I had overwatered it. And (or) if it it could be too cold in my house. Fellow garden tweeps said they didn’t think the coolness of the house should be a problem, but they did think the soil looked kind of “yucky.” Too heavy and wet. Apparently, I shouldn’t have used soil with fertilizer, in my case Miracle-Gro. I can’t really remember, but I think I’ve pretty much always used some type of potting/garden soil with Miracle-Gro in it. in fact, when I looked at the different types of soil sold at a local store yesterday, all but one had Miracle-Gro/fertilizer in them. But I did find one brand that said it was just composted forest products, top soil, sand and perlite. Since the addition of perlite was something my garden tweeps also suggested, I bought a couple small bags. 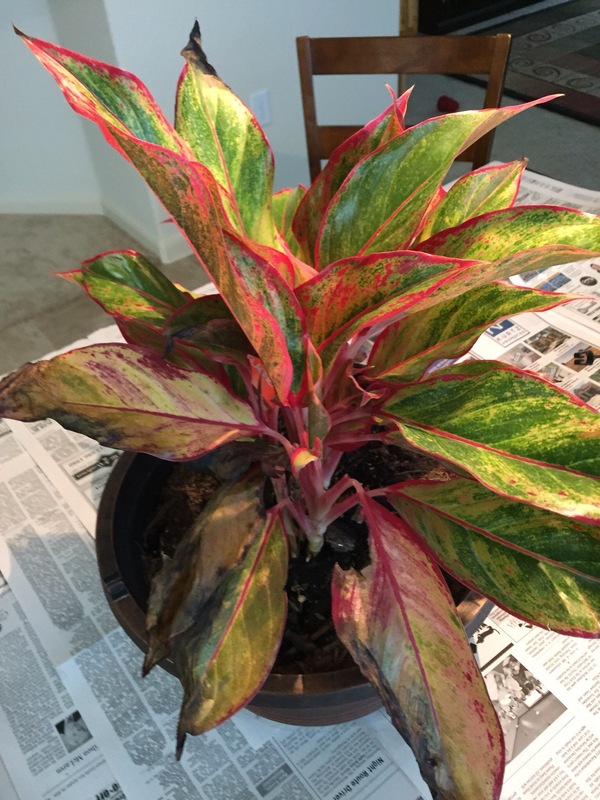 Since the weather wasn’t allowing any outdoor activities (freezing rain off and on), today was the perfect day to repot the aglaonema and cut off the browning leaves. It took less than a half hour and left plenty of time for other dreary weather activities, like baking! A chocolate cake and garlic and brown sugar chicken for supper kept the house nice and cozy, not to mention smelling great. 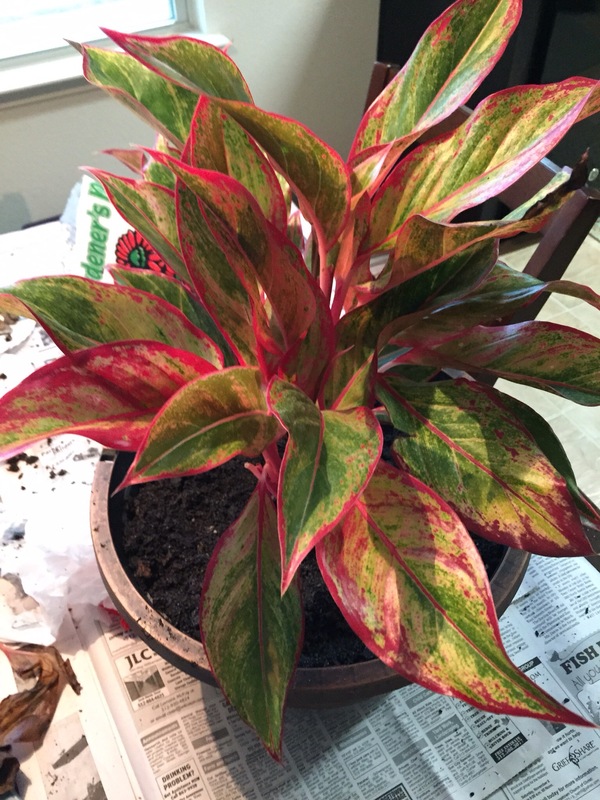 I also decided to put the repotted aglaonema in a warmer room in the house to see if that helps. At least, hopefully, until it warms up and I can return it to my patio outside. This entry was posted in Gardening and tagged flowers, plants on January 10, 2015 by Julie Riebe.